In New York City this Friday, amidst all sorts of fanfare, world leaders are gathering at a signing ceremony of the Paris climate agreement that was finalized last December. There's a celebratory mood about the whole thing, but some climate activists and organizations are more skeptical. What gives? Why would anyone who wants to see urgent action to tackle climate change be critical of the Paris agreement? The Paris Agreement is a strictly voluntary, nonbinding regime when what is really needed is a "carbon budget" approach in which countries are required to cut emissions in line with their historical responsibility for causing the climate crisis. This was seen as a bit of a party foul at the time, an unwelcome intrusion of realism in a space where the primary concern was political pragmatism. But Oquist's intervention, undiplomatic though it may have seemed, put forth several important ideas for which ActionAid and our allies had been beating the drum for months. And the Civil Society Equity Review of countries' pledges for emissions cuts evaluated those pledges in the context of fairness (are countries doing what their fair share of effort?) and science (do the pledges add up and get us to the global goal of keeping average warming below 2 degrees?). The Equity Review showed that the Paris agreement failed on both accounts: it was neither fair nor strong. Pledged action by the rich industrialized countries was, across the board, pathetically weak - not to mention purely voluntary. Taken on its own, the agreement failed the poor and it failed the planet. Getting 190+ countries on board with the Paris agreement was undeniably impressive. 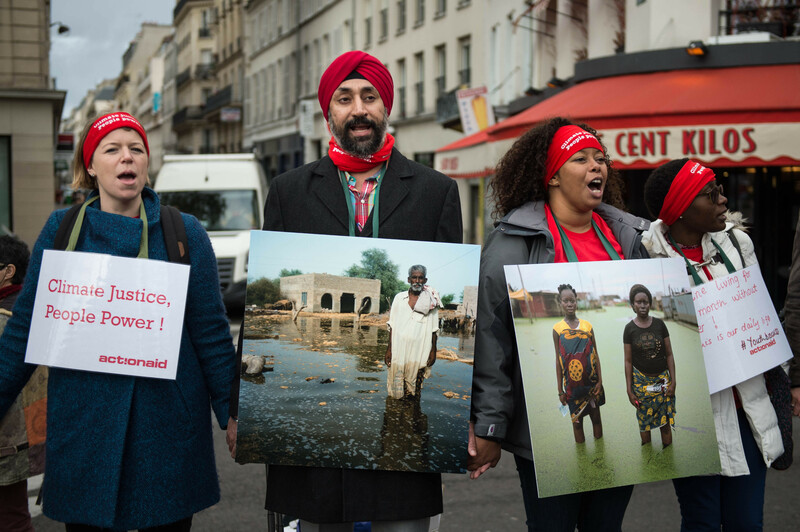 But in order to achieve that goal, the agreement itself had to be so watered down that groups that represent the people in the world who are most vulnerable to climate impacts, including my organization ActionAid, could not in good conscience celebrate it. And climate scientists - especially those who manage to keep a clear perspective about the challenge we face without being overly concerned with what might be politically feasible to do - were equally unimpressed. In other words, from the perspective of the world's most vulnerable people facing the real, hard impacts of climate change - and scientists facing the cold, hard facts of climate change - the Paris agreement isn't much worth celebrating. It simply doesn't deliver what is needed. So the interesting question is not why would anyone be critical of the Paris agreement - rather, it is, why would anyone be celebrating the Paris agreement? The most useful answer to that question is that the Paris agreement, while it doesn't actually require anyone to do anything, does provide hooks to push for the changes the world needs. The agreement is purely aspirational, but then so is much of international law. In and of itself, the Paris agreement will likely do very little. But when huge swaths of people whose lives and livelihoods are threatened by climate change demand that governments live up to, and exceed, what they said they would do in the Paris agreement, then we might begin to dream that the aspirations might actually be met. Celebrating the Paris agreement itself is premature. What will be worth celebrating is the action that must follow - action to follow through on the Paris agreement, radically strengthen the commitments, and ensure that the implementation is just and fair for the world's poorest, most vulnerable, and most marginalized people.